iRewind Talk: Top 80's animated movies anyone? Author Topic: Top 80's animated movies anyone? Nausicca Valley of the Winds (a.k.a. Warriors of the Winds). Pinocchio and the Emperor of the Night. Urotsukidoji: Legend of the Overfiend. He-Man/She-Ra Secret of the Sword. Little Nemo Adventures in Slumberland. Transformers: The Movie changed my life. This post is dedicated to Stan Bush. Thank you for your sweet sounds. Any of my faves anyone else's faves too? The Land Before Time! It made me cry but I was only little. I have seen these and own most of them on VHS or dvd. The movie and the soundtrack are classics! Stan is still alive and kickin´. New cd Dream the Dream (2010) just out. HarryCanyon, my absolute favorite 80's animated flick, "Twice Upon a Time," made your list! Yay!!! It may be one of the most obscure, hardest-to-find films from the 80's, but boy, oh boy, is it worth it because it's one of the funniest, most imaginative, classiest animated films of any decade. And how can you not love a movie where the hero is "Ralph, the All-Purpose Animal"? To my knowledge it has had no official DVD release in North America, and a VHS copy will cost you plenty. To my surprise and delight, I finally tracked down a copy of it earlier this year, and I will continue to rave about it anyone who will listen. It's a film that children will like, but adults will love. I remember reading an article about the sad story behind the movie: George Lucas financed it, the two animator/creators got into a wrangle over the final cut (one guy had put in dirty words for an "adult" cut; the other guy cut out the bad language) and one threatened to sue the other, the Ladd Company was going bankrupt at the time and just dumped the film into a couple of theatres with no ads, the different versions showed up in the mid-80's on the pay channels amidst more talk of lawsuits, and the extremely hard-to-get-at-the-time VHS tape went out of print, thus making it a veritable "lost" film unless you taped it off of cable back in the day. Does anyone else remember this little masterpiece? The Secret Of Nimh was always my favorite...I think because it was always on the movie station when I was young, and I watched it about 20 times back in the day. As an adult, I have a copy on DVD and still like to visit this little treasure from time to time...mostly by trying to make my neices and nephews watch it! The movie "Heavy Metal" was just an awesome flick! I enjoyed every segment and rented it numerous times. And let's not forget the Unico films either; both well-written and imaginative with genuinely scary villains and a full gammot of emotions from suspenseful to poignant, and they both hold up well today (I'm told a third one actually was made, but was only ever seen inside the screening room at the Japanese animation studio). Tough call to pick a favorite of the decade, but if I had to go with just one, I'd say An American Tail, which basically sums up everything good about Don Bluth's too often overlooked career. Although the denouement drags a bit, that's really the only flaw to a film with a good story that can occasionally be a little frightening (Bluth was never afraid to be scary, and starting the film with a full-on pogrom, then following that up with Fievel being dramatically washed overboard, shows the firm resolve of someone not afraid to take chances), and even melancholy when the characters may lose hope, but without pounding us over the head with it, it shows us that they who never completely give up shall in the end find their happy ending. And who can deny "Somewhere Out There" was one of the best themes songs of the decade? It's really a no-brainer. In regards to Twice Upon a Time, the Real Cartoon Network aired the family friendly cut a few times in the late 90s (I hear the cast also was shaken up before the end, and Lorenzo Music, for instance, was a last minute hire). It may be a hair bizarre at times, but in a way, that's part of its charm, and one wishes it could have had a better fate than what befell it. Well your in luck because the uncut Twice Upon a Time is on youtube.com. Fire and Ice: Ralph Bakshi teaming with the legendary Frank Frazetta...awesome!!! American Pop: A very good generation-spanning storyline and some great music...love this one. Heavy Metal: Uneven animation, but a fantastic concept that fit in with the tone of the magazine, and, again, great music. 3 awesome choices, i grew up with American Pop and Heavy Metal on TBS back in 93 when i was 12 years old with Vampire Hunter D and Robot Carnival. I even bought HM and AP whe they hit video, i also grew up with Fire and Ice when i was 5 years old watching it with my big brother. Forgot to mention Unico 1 & 2. I rewatched those on youtube because i saw those when i was little. Great list there, I've seen a lot of those and some I haven't so I'll have to track them down. One I'd add to the list is: Time Masters (1982), a French animated film set in space that's really rather good. And among foreign features not mentioned so far, I also did enjoy the English dub of Spain's Katy the Caterpillar when the Real Disney Channel would air it. Haven't seen Time Masters since High School. I read The Last Unicorn as a young teen, it was very good. That was a hard to watch scene but it's just an amazing live-action/animated movie. Abra Cadabra. A little known, fabulous film that merits being more widely celebrated. I have another one that has not been mentioned. I have to hand the novel Grendel on which the film is based and I have read it. Fantastic stuff! Hayao Miyazaki´s early masterpiece is pure eyecandy and the story rocks too. Highly recommended! 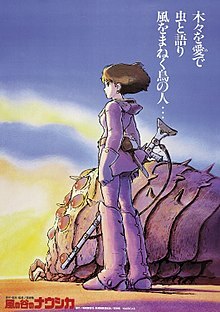 Another 80s Miyazaki classic. Wonderful animation with a message, highly recommended! 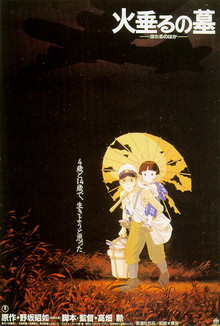 "A young boy and his little sister struggle to survive in Japan during World War II."